The first strike to appear in 2012 as part of the US Mint's Presidential $1 Coin Program will be the 2012 Chester A. Arthur Presidential $1 Coin. Shown on the obverse of the strike will be a portrait of the 21st President of the United States who served in office from 1881 until 1885. 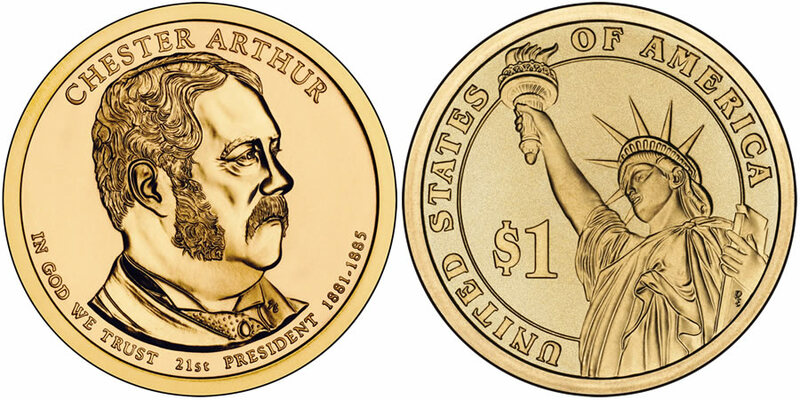 Like other coins of the series, the Chester A. Arthur Presidential $1 Coin will contain the image of the Statue of Liberty on its reverse. The US Mint strikes four new coins for the program annually each featuring a former US President. The release order of the strikes is dictated by the order in which they served with the first strike of the series appearing in 2007 with the George Washington Presidential $1 Coin. Arthur assumed the Presidency after the assassination of the previous President, James A. Garfield (whose coin was released in 2011). Despite rocky beginnings in his administration, he eventually became liked and respected by most in Washington but only served one term mainly due to his health. The obverse of the coin contains a portrait of Chester A. Arthur. Obverse inscriptions include "CHESTER A. ARTHUR ," "21ST PRESIDENT," "1881-1885" and "IN GOD WE TRUST."